By 1346 England had been embroiled in the Second War of Scottish Independence since 1332 and the Hundred Years' War with France since 1337. In January 1343 the French and English had entered into the Truce of Malestroit, which included Scotland and was intended to last until 29 September 1346. In defiance of the truce, hostilities continued on all fronts, although mostly at a lower level; King David II of Scotland (r. 1324–1371) led a six-day raid into northern England in October 1345. Edward III of England (r. 1312–1377) planned an invasion of northern France in 1346 and King Philip VI of France sent an appeal to David II to open a northern front. Philip VI wanted the Scots to divert English troops, supplies and attention away from the army under Edward III which was gathering in southern England. The Auld Alliance between France and Scotland had been renewed in 1326 and was intended to deter England from attacking either country by the threat that the other would invade English territory. In June Philip VI asked David II to attack pre-emptively: "I beg you, I implore you... Do for me what I would willingly do for you in such a crisis and do it as quickly... as you are able." Edward III landed in Normandy with an army of 15,000 in July. Philip VI renewed his pleas to David II. As the English had also committed troops to Gascony, Brittany and Flanders, Philip VI described northern England to David II as "a defenceless void". David II felt certain that few English troops would be left to defend the rich northern English cities, but when the Scots probed into northern England they were sharply rebuffed by the local defenders. David II agreed a truce, to last until 29 September, in order to fully mobilise the Scottish army, which was assembling at Perth. By the time the truce expired, the French had been decisively beaten at Crécy and the English were besieging Calais. The French were also in difficulty in south-west France, where their front had collapsed, with the major city and provincial capital of Poitiers, 125 miles (201 km) from the border of English Gascony, falling on 4 October. On 7 October the Scots invaded England with approximately 12,000 men. Many had modern weapons and armour supplied by France. A small number of French knights marched alongside the Scots. It was described by both Scottish and English chroniclers of the time, and by modern historians, as the strongest and best equipped Scottish expedition for many years. The border fort of Liddell Peel was stormed and captured after a siege of three days and the garrison massacred. Carlisle was bypassed in exchange for a large indemnity and the Scottish army moved east, ravaging the countryside as they went. They sacked Hexham Abbey, taking three days to do so, then advanced to Durham. They arrived outside Durham on 16 October and camped at Beaurepaire Priory, where the monks offered the Scots £1,000 (£910,000 as of 2019[note 1]) in protection money to be paid on 18 October. The invasion had been expected by the English for some time; two years earlier the Chancellor of England had told parliament that the Scots were "saying quite openly that they will break the truce as soon as our adversary [France] desires and will march into England". 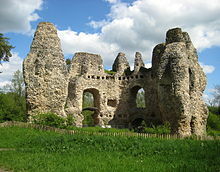 Once the Scots invaded, an army was quickly mobilised at Richmond in north Yorkshire under the supervision of William de la Zouche, the Archbishop of York, who was Lord Warden of the Marches. 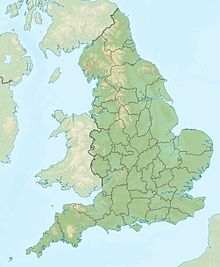 It was not a large army: 3,000–4,000 men from the northern counties of Cumberland, Northumberland and Lancashire; it is known that Lancashire contributed 1,200 longbowmen and a small number of lightly armed border cavalry, known as hobelers. Another 3,000 Yorkshiremen were en route to reinforce their fellow northerners. This was possible because Edward III, when raising his army to invade France, had exempted the counties north of the River Humber. On 14 October, while the Scots were sacking Hexham Abbey, the Archbishop decided not to wait for the Yorkshire troops and marched north west towards Barnard Castle, and then rapidly north east to Durham. He was joined en route by the Yorkshire contingent and Lord Ralph Neville took command of the combined force of 6,000–7,000 men. The Scots at Beaurepaire only discovered the English army on the morning of 17 October, when they were some 6 miles (10 km) away. Around 500 men under William Douglas stumbled upon them in the morning mist during a raid near Merrington, south of Durham. The two rear divisions of the English army drove them off with heavy Scottish casualties, around 300. Douglas raced back to David II's camp, alerting the rest of the army, which stood to arms. The same morning two Benedictine monks arrived from Durham in an attempt to broker a peace but David II, thinking they were spies, ordered their beheading; the monks escaped in the confusion. David II led the Scottish army to the high ground at Neville's Cross, less than half a mile (800 m) to the west of Durham and within sight of Durham Cathedral, where he prepared for battle. Both the Scots and the English arranged themselves in three formations, or battles. On the Scottish side, David II took control of the second battle, and placed John Randolph, the Earl of Moray, in charge of the first battle. Patrick Dunbar, the Earl of March, took command of the third battle. The contemporary sources are not consistent, but it seems that the Scots formed up in their traditional schiltrons, each battle forming a rectilinear formation. The front ranks were armed with axes and long spears carried by the rear ranks protruded past them. The knights and other men-at-arms dismounted and stiffened the formations, usually at the very front. A screen of archers skirmished to the front, and each flank of the army was shielded by hobelars and further archers. As the mist lifted, it became clear that the Scots were poorly positioned, on broken ground and with their movement made difficult by ditches and walls. They remembered their defeats at Dupplin Moor and Halidon Hill and so took a defensive stance, waiting for the English to attack. The English similarly divided their forces with Lord Henry Percy commanding their first battle; Neville their second; and the Archbishop of York their third. Neville remained in overall command. The English were entirely dismounted, with each battle having men-at-arms in the centre and longbowmen on each flank. The English also took a defensive stance, knowing they had the superior position and that time was on their side; their morale was high. The resulting stalemate lasted until the afternoon, when the English sent longbowmen forward to harass the Scottish lines. On the English left the Scottish light horse and archers withdrew under the arrow fire and the English were able to shoot into the flank of Moray's battle. The Earl of Menteith attempted to clear away the English archers with a cavalry charge, but this failed and he was taken prisoner. The archers succeeded in provoking the Scots into attacking. Moray's battle led the assault, but the broken terrain and obstacles slowed their advance and made it difficult for them to maintain formation. The longbowmen were able to fall back behind their men-at-arms. By the time the disorganised battle came to hand-to-hand combat it was easily dealt with it. Seeing their first attack repulsed, and also being harassed by the English archers, the third and largest Scottish battle, on the Scottish left under the Earl of March and Robert Stewart,[note 2] broke and fled. The English stood off from the remaining Scots under David II and poured in arrows. The English men-at-arms then attacked and after fighting described as "ferocious", the Scots attempted unsuccessfully to retreat and were routed. The English men-at-arms outfought superior numbers of the Scottish foot, while the performance of the English archers was mixed. Most of them were participating in their first pitched battle, or even their first combat. Many groups of bowmen conspicuously hung back, while the Lancashire longbowmen received a post-battle bonus of £10 each (£9,100 in 2019 terms). David II, badly wounded, was captured after he fled the field, while the rest of the Scottish army was pursued by the English long into the night. More than 50 Scottish barons were killed or captured; Scotland lost almost all of its military leadership. The Scottish dead included: the Constable, Lord David de la Hay; the Marischal, Robert de Keith; the Chamberlain, John Roxburgh; the Chancellor, Lord Thomas Charteris; two earls, John Randolph, Earl of Moray and Maurice de Moravia, Earl of Strathearn; and Niall Bruce of Carrick, an illegitimate son of Robert the Bruce. An unknown number of Scots were taken prisoner. It is believed that only Scots thought able to pay a ransom were spared, others being slain out of hand. Scottish nobles who were captured included William Douglas, the "Knight of Liddesdale", their most skilled guerilla fighter, and four earls. Scottish chroniclers Andrew of Wyntoun and Walter Bower both wrote that 1,000 Scots were killed in the battle, while the Chronicle of Lanercost said that "few English were killed". Modern historians Given-Wilson and Bériac have estimated that some 3,000 Scotsmen perished while fewer than 100 were taken prisoner. Accounts of the time state that after the battle David II was hiding under a bridge over the River Browney when his reflection was seen in the water by a group of English soldiers. David II was then taken prisoner by John de Coupland, who was leading the detachment and who had his teeth knocked out by the King. During the battle David II was twice shot in the face with arrows. Surgeons attempted to remove the arrows but the tip of one remained lodged in his face, rendering him prone to headaches for decades. Edward III ordered David II to be handed over to him, rewarding Coupland with a knighthood and an annuity of £500 for life (£460,000 per year in 2019 terms). Despite having fled without fighting, Robert Stewart was appointed lord guardian to act on David II's behalf in his absence. All of the Scottish captives were ordered to London, to the disgust of their captors who had a legal right to ransom them. A significant number of Scottish prisoners were privately ransomed, their captors subsequently attempting to deny that they had been taken, which outraged Edward III. Edward III refused to ransom any of those who were passed on to him, or release them on parole as was traditional; he wished to cripple the Scottish capacity to make war for as long as possible, by depriving them of their leaders. In at least some cases he paid considerable sums to their captors to buy out their ransom rights. John Graham, Earl of Menteith, had previously sworn fealty to Edward III, who considered him guilty of treason. On the King's direct orders he was tried, condemned and then drawn, hanged, beheaded and quartered. In early 1346 two English forces made large scale raids deep into Scotland. They met little opposition and devastated much of southern Scotland. Border raids, often accompanied by devastation of the countryside, and sometimes on a large scale, continued to be launched by both the Scots and the English. However, the battle effectively removed the strategic threat to Edward III's rear, and by 1349 the English border counties were able to guard against the remaining Scottish threat from their own resources. On three separate occasions Edward III offered to release the childless David II for £40,000 (approximately £37,000,000 in 2019 terms) if he would accept one of Edward III's sons as his heir to the Scottish throne. All three offers were refused. Eleven years after the battle David II was released in exchange for a ransom of 100,000 marks (approximately £61,000,000 in 2019 terms.) The ransom was to be paid over a ten-year span, on 24 June (St. John the Baptist's Day) each year, during which an Anglo-Scottish truce prohibited any Scottish citizen from bearing arms against Edward III or any of his men. This truce proved to be effective for four decades and marked the end of the Second War of Scottish Independence. The Battle of Neville's Cross is named after an old Anglo-Saxon stone cross near Beaurepaire. After the victory, Lord Ralph Neville paid to have a new cross erected to commemorate the day. The Black Rood, venerated as a piece of the True Cross, and previously belonging to the former Queen of Scotland, St Margaret, was taken from David II and donated to the shrine of St Cuthbert in Durham Cathedral. The site of the battle has been listed as a registered battlefield by Historic England. The fate of King David II is recalled in Shakespeare’s play Henry V. In Act 1 Scene 3, Henry discusses the Scottish invasion with the Archbishop of Canterbury. The last lines refer to an earlier play that would have been known to Shakespeare's audience, The Reign of Edward III, at the end of which John de Coupland brings the captured David II to Edward III in Calais; where he meets the Black Prince, who has captured the French King. ^ UK Retail Price Index inflation figures are based on data from Clark, Gregory (2017). "The Annual RPI and Average Earnings for Britain, 1209 to Present (New Series)". MeasuringWorth. Retrieved 28 October 2018. To give a very rough idea of earning power, an English foot-soldier could expect to earn £1 in wages in approximately 3 months for, usually seasonal, military service. ^ Robert Stewart was David II's nephew, the heir-apparent, and a future king of Scotland (as Robert II). After the battle he became Lord Guardian of Scotland, regent for the captured David II. ^ a b Maxwell 1913, p. 330. ^ Sumption 1990, pp. 507–508. ^ a b Sumption 1990, p. 499. ^ a b Brown 2004, p. 247. ^ a b Sumption 1990, p. 500. ^ Crowcroft & Cannon 2015, pp. 379–380. ^ Sumption 1990, p. 504. ^ a b Penman 2004, pp. 157–180. ^ a b Sumption 1990, p. 550. ^ a b c Wagner 2006, pp. 228–229. ^ Maxwell 1913, p. 332. ^ Gribit 2016, p. 37. ^ Sumption 1990, pp. 550–551. ^ Burne 1999, p. 218. ^ Sumption 1990, p. 552. ^ Prestwich & Rollason 1998, p. 143. ^ a b DeVries 2006, p. 181. ^ a b Maxwell 1913, p. 336. ^ Maxwell 1913, p. 337. ^ Prestwich & Rollason 1998, p. 88. ^ Maxwell 1913, p. 339. ^ a b c Sumption 1990, pp. 552–553. ^ Maxwell 1913, p. 335. ^ Oman 1998, p. 150. ^ a b c d e Sumption 1990, p. 553. ^ Boardman 2006, pp. 3, 40. ^ Sadler 2013, p. 228. ^ Prestwich 1980, p. 267. ^ Maxwell 1913, p. 341. ^ a b Sumption 1999, p. 143. ^ Oman 1998, p. 151. ^ Fraser 1878, p. 15. ^ King 2002, pp. 269–270. ^ a b Given-Wilson & Bériac 2001, p. 809. ^ Prestwich & Rollason 1998, p. 26. ^ Prestwich & Rollason 1998, p. 140. ^ Rogers 1998, p. 51. ^ Prestwich & Rollason 1998, p. 146. ^ King 2002, p. 269. ^ Sumption 1990, p. 554. ^ King 2002, pp. 281–282. ^ King 2002, p. 282. ^ King 2002, p. 278. ^ Burne 1999, p. 219. ^ Sumption 1999, pp. 145–148. ^ Given-Wilson & Bériac 2001, p. 811. ^ Prestwich & Rollason 1998, pp. 59–60. ^ Penman 2004, p. 129. Boardman, Stephen I. (May 2006). Robert II. Oxford Dictionary of National Biography (online ed.). Oxford University Press. Retrieved 19 October 2008. Brown, Michael (2004). The Wars of Scotland, 1214–1371. Edinburgh: Edinburgh University Press. ISBN 978-0748612383. Burne, Alfred (1999). The Crecy War. Ware, Hertfordshire: Wordsworth Editions. ISBN 978-1840222104. Crowcroft, Robert; Cannon, John (2015). "Franco-Scottish Alliance". The Oxford Companion to British History. Oxford: Oxford University Press. pp. 379–380. ISBN 978-0199677832. DeVries, Kelly (2006). Infantry Warfare in the Early Fourteenth Century: Discipline, Tactics, and Technology. Woodbridge, Suffolk: The Boydell Press. ISBN 978-0851155715. Fraser, William (1878). The Scotts of Buccleuch. 1. Edinburgh: W Fraser. OCLC 866515784. Given-Wilson, Chris; Bériac, Françoise (September 2001). "Edward III's Prisoners of War: The Battle of Poitiers and its Context". The English Historical Review. 116 (468). ISSN 0013-8266. Gribit, Nicholas (2016). Henry of Lancaster's Expedition to Aquitaine 1345–46. Woodbridge, Suffolk: Boydell Press. ISBN 978-1783271177. King, Andy (2002). "According to the Custom Used in French and Scottish Wars: Prisoners and Casualties on the Scottish Marches in the Fourteenth Century". Journal of Medieval History. 28: 263–290. ISSN 0304-4181. Maxwell, Herbert, ed. (1913). The Chronicle of Lanercost, 1272–1346: Translated, with notes. Glasgow: J. Maclehose and Sons. OCLC 457526322. Oman, Charles (1998) . A History of the Art of War in the Middle Ages: 1278-1485 A.D. London: Greenhill Books. ISBN 978-1853673320. Penman, Michael (2004). David II. East Linton, East Lothian: Tuckwell Press. ISBN 978-1862322028. Prestwich, Michael C. (1980). The Three Edwards: War and State in England 1272–1377. London: Weidenfeld and Nicolson. ISBN 0-297-77730-0. Prestwich, Michael; Rollason, David (1998). The Battle of Neville's Cross, 1346. Stamford: Shaun Tyas for the North-East England History Institute. ISBN 978-1900289191. Rogers, Clifford J (1998). "The Scottish invasion of 1346". Northern History. xxxiv. ISSN 0078-172X. Sumption, Jonathan (1990). Trial by Battle. The Hundred Years War. I. London: Faber and Faber. ISBN 978-0571200955. Sumption, Jonathon (1999). Trial by Fire. The Hundred Years War. II. London: Faber and Faber. ISBN 978-0571138968. Wagner, John A. (2006). "Neville's Cross, Battle of (1346)". Encyclopedia of the Hundred Years War. Woodbridge, Suffolk: Greenwood. pp. 228–229. ISBN 978-0313327360. "Battle of Neville's Cross 1346". Historic England. Historic Buildings and Monuments Commission for England. 6 June 1995.